Added the recent Procol Milan setlist with some characteristically terse and under-written song-notes from one of the BtP webmasters ... how the band used a standard B3, how the antics of local knock-off merchants were received, and how Procol triumphed over adversity with the encouragement of a very warm Italian crowd, and much more twaddle besides – including a new Brooker fishbag snap. Procol Harum are now on course to play the Finnish gigs that were previously shadowed with contractual uncertainty. If you're there, please send setlists and so on to webmaster@procolharum.com . There will be Fiftieth Anniversary Tour Booklets, lotto-badges (click image, right) CDs and tee-shirts at the merchandise stall. 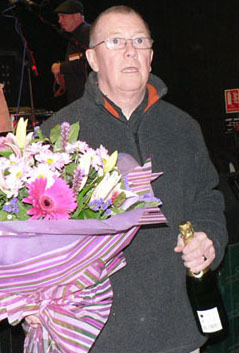 Major Procol Harum fan wins outstanding prize! 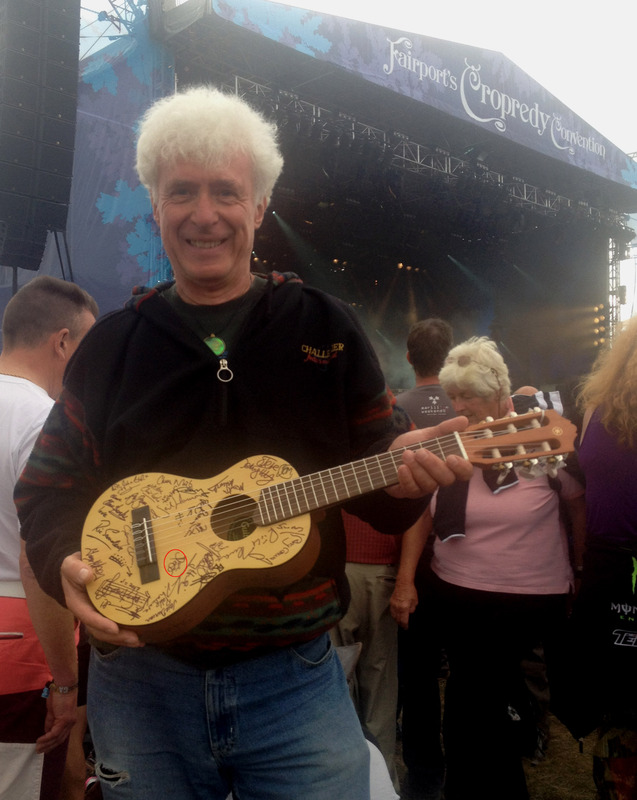 Michel Birrell, one of a number of Palers who were at the UK's three-day Cropredy Festival last week, bought one ticket to support Fairport Convention's choice of charity, and in hopes of winning a signed guitar. Out of 20,000 punters, many buying multiple tickets, he was the Only One ... see the signatures here (including Richard Thompson! Procol ancestors are circled in red). 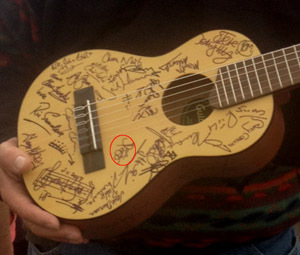 Michel reports, 'When I checked out my prize guitar when I got home it contains the autographs of not only Feast of Fiddles but also past and present members of Fairport Convention and many of the other musicians and singers who performed'. Watch these pages for news of a Procol Harum raffle starting in a couple of weeks' time, and the excellent prize associated. The odds in this raffle will be very much shorter ... much more in the buyer's favour! To keep abreast of developments, sign up for the 'Fresh Fruit' Newsletter. 'Sadly, I've heard that Mick Brownlee has died. He had a long battle with a blood cancer but kept on playing throughout - worthy of a 'Titanic Award'. 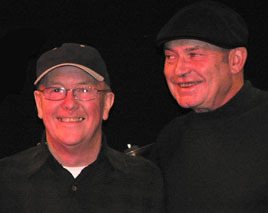 He was so important in the first years of The Paramounts and always remained a very close friend. Our thoughts are with Doreen, who has lost him for now. When Robin and I were first drifting around Southend in the late '50s trying to somehow be involved with the inchoate local rock scene we were in some band or another and ended at the famous night at the place atop of Pier Hill where Mick Brownlee was playing in another band. (Gary in another, and Bob Scott singing in another still). Whatever the reason for the night (Battle of the Bands, or whatever), one thing was quite clear: Mick was our man for drums. There not many decent drummers around in those days (certainly not where we were) but he was the very thing we needed. I think Robin (maybe in conjunction with the venue's manager) was the architect of assembling The Paramounts. He somehow wheedled Gary over, Mick already being in on the deal. The golden days began when we no longer had Bob Scott, Billy Kent or whoever fronting the band – and with no singer in mid-Essex one Saturday evening we decided to split the vocals. By the end of the night the decision was unanimous: Gary was our singer. And that's when we inculcated bits of Wilk's record collection into our set. They were golden days indeed until I went to Uni, and Mick got married. But it was the start of something special. Mick was always very amusing and never moody. He drove the band. So it was great to be able to catch up for that final reunion at The Cricketers (where we'd first rehearsed) in 2005. I had also seen Mick at Gary's house in 2002 when he and Dave Bronze had everyone in fits with their jokes (and delivery of). He mentioned his battles with illness at the reunion, but it seems he battled bravely to make it till this year. God bless you Mick, and my wishes to Doreen. 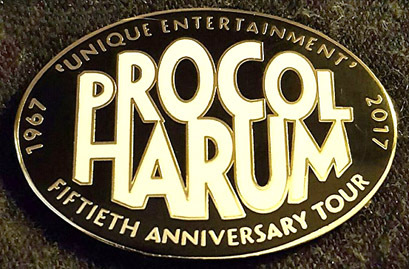 Many customer enquiries/inquiries about the fab little enamel and brass 'Fiftieth Anniversary' lapel-badges you saw on the recent Procol merchandise stand (photo, right. thanks Paul). We're debating whether to have more made, the first batch having sold out completely on the UK tour. Added the setlist from Procol Harum's Shepherds Bush Empire (02) show ... every bit as good as the Liverpool recital, and to a packed London audience! 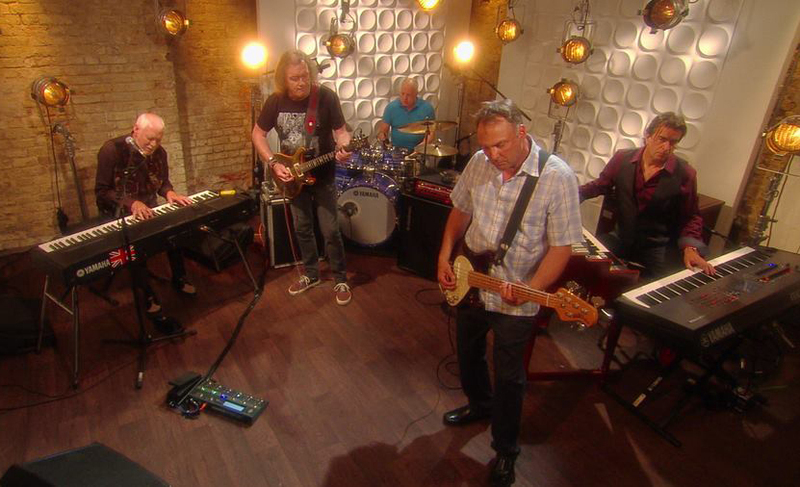 Follow 'Beyond the Pale' on Twitter (http://twitter.com/ProcolHarum1) and at the somewhat new 'Beyond the Pale' Facebook page, where we hope gigs / events can be more easily spotted than they are amid the busy newsfeed on our former Procol Facebook group. 'If you still enjoy what you do, why stop? Happy Novum day! 'Beyond the Pale' salutes Procol Harum and their manager Chris Cooke on today's release of a new album, a great critical and artistic success. We can't wait to hear this excellent new music live! 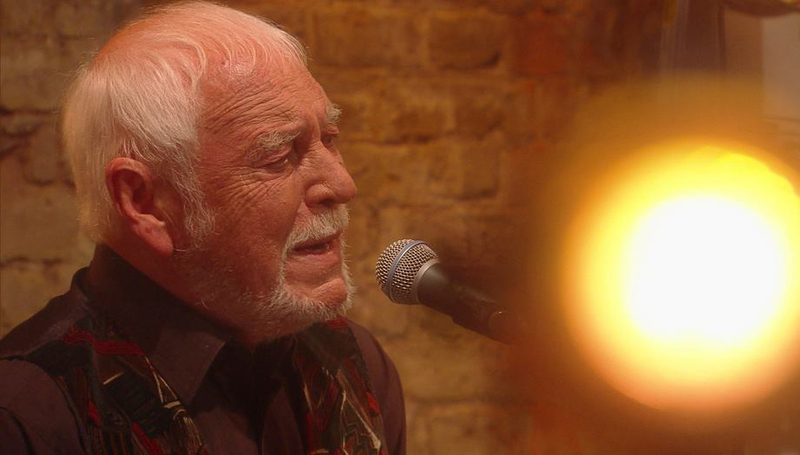 Added a link to a fan's clip of Gary Brooker signing autographs in London outside the BBC. Very pleasing numbers of Harum completists sent BtP their orders for a free copy of the Procol Phone-taps book. 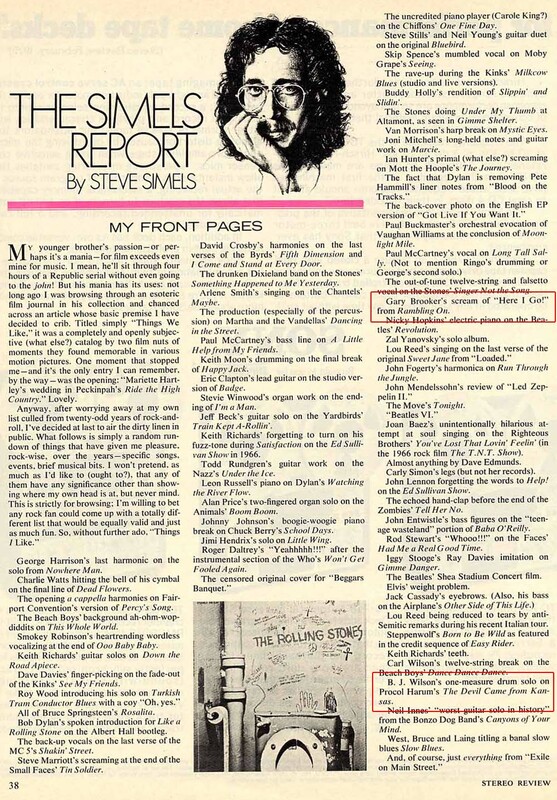 The fact that all the Procol content had apparently been deleted from the transcripts did not deter them in the slightest. Well done, all! BtP is not planning a social event in the Scottish capital, but if you're interested in an aftershow fans' get-together in Edinburgh, at 'The Green Mantle' (EH8 9JP) send a mail to organiser George Beck (g.beck3@ntlworld.com). Procol Harum's new single was NOT selected for BBC Radio 2's playlist. Many new goodwill messages to Gary Brooker, for which he sends his thanks. 'I shall print them off, and take them to the Palace when I go to receive my knighthood'. 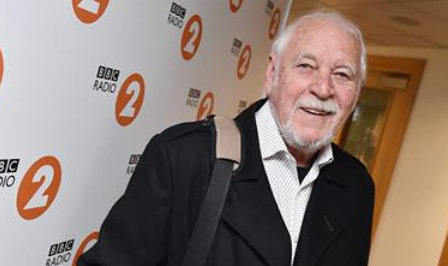 Gary Brooker on Steve Wright's BBC Radio 2 afternoon show. Wright played a bit of Conquistador and a bit of A Whiter Shade of Pale, then chatted to Gary in his characteristic manner, after which a bit of Sunday Morning and a bit of Last Chance Motel were played. In this mp3 taken from the broadcast we preserve all GB's speech and the DJ carry-on, but we fade the tracks. Preserved, too, are the BBC's strange jump cuts into AWSoP (around 17.5 seconds) and into LCM (about 5.16). For those who fancy listening to the whole show, it's at http://www.bbc.co.uk/programmes/b08gmhr5 and you'll hear Gary at about 2hr.42m. Pre-ordering for Procol Harum's new album, Novum, is now available at Amazon. When ordering, please use these direct links ... Amazon UK / Amazon USA ... so 'Beyond the Pale' gets a few cents per sale, which helps keep the website afloat! As promised, the BtP Festival Hall ticket-service (formerly on this page) was de-activated at 23:59 GMT on 1 March ... after that time the BtP team will be travelling to London and there will be no possibility of supervising it. We must have united about thirty needy customers with surplus tickets – reducing the holes in the audience. Commiserations to people whose tickets went unclaimed. Booking for the pre- and post-show celebrations on 3 March 2017 is now suspended, and successful applicants have been alerted. If your plans change and you want to be removed from the guest-list, or the waiting-list, please let us know without delay! Added the last in our annual series of Christmas puzzles. Good luck with the instructions that follow it (click link provided, to change pages): just read 'em carefully (take your time!) and all will be well. Added the eleventh in our annual series of Christmas puzzles. Don't forget to be ready with your preference order for the fab prizes – all the letters, please! – something like: "AGBHCDEF"
The final clue is scheduled to appear on this page (press F5 or 'Reload' to ensure your browser shows the latest version) at midnight London time (GMT), when Wednesday 4 January becomes Thursday 5 January. 1 January 2017: Happy New Year! 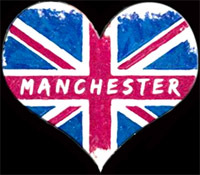 Fans in the UK were well-served this year, with three Procol gigs on home soil! Holland, Finland and Monaco also had great shows, and the Zoetermeer Convention – not our largest party, but a memorable one nonetheless – saw Palers playing live music and again enjoying the company onstage of Geoff Whitehorn on guest guitar, and Gary Brooker MBE singing his own The Angler and (a world première) Procol’s The Pursuit of Happiness. Many thanks to all the friends who helped us organise this event, in particular Frans Steensma and our local mainstay, Hans Tammes. Unusually there were almost as many Brooker solo appearances as there were Procol shows this year, one in Germany and four in Manhattan: all received with fervour by local audiences. We occasionally see notes on our former Facebook group from people who ‘found out about this show by chance’ or who ‘wish they’d known about the Zoetermeer Convention’. Wise up, folks! ‘Beyond the Pale’ extensively publicises these events from the moment they are contractually confirmed, as does the ‘Beyond the Pale’ Facebook Group. Though there have been a lot of good Procol moments to look back on this year, we really do have more than one eye on the future as 2017 dawns, the fiftieth anniversary of this great band. In some ways it seems completely incredibly that Procol Harum still exists as a powerful live unit, to delight, move, excite and mystify fans after half a century. In other ways – considering the energy of fans and the enormous goodwill that emanates from so many great people involved – it seems almost inevitable. Our thanks of course to Gary, Geoff, Matt, Josh and Geoff, to manager Chris Cooke and (Strongwoman) Franky Brooker, and the great crew that presents the band on stage. A glance at the gigs list for 2017 speaks volumes about the band’s vitality. Their return to Scotland after forty years, their first UK tour for yonks, and the growing spread of substantial dates across mainland Europe … all this signals a year to remember. Bookmark the What’s New page at Beyond the Pale (www.procolharum.com/whatsnew.htm : do it now!) and sign up for the (free) newsletter (www.procolharum.com/99/newslist.htm : do it now!) and you’ll be bang up to date the minute some exciting developments are officially announced. We’re not planning any major convention for 2017, but we know there will be great local gatherings of fans in many cities, with a lot to talk about! Meanwhile, good luck with those Christmas Quizzes ... time to size up the prizes and get to grips with the remaining few clues. Added the eighth in our annual series of Christmas puzzles. Hope you're still having fun, and still making plenty of notes along the way, to save time in the finale. Just to recap: you can usually track down which Procol song contains a particular word (such as 'bottom') by typing into Google this formula – site:procolharum.com/w bottom. Added the fourth in our annual series of Christmas puzzles. Hope you're having fun, and making plenty of notes along the way, to save time at the end. Memorandum: you can usually track down which Procol song contains a particular word (such as 'torture') by typing into Google this formula – site:procolharum.com/w torture. You can usually track down which Procol song contains a particular word (such as 'seasick') by typing into Google this formula – site:procolharum.com/w seasick . 25 December 2016: Happy Christmas! Added the first in our annual series of Christmas puzzles – good luck everyone! They do get easier and easier, as our fab prizes get more and more munificent. Good luck to all involved in the spectacular series of four Gary Brooker solsticial performances in Manhattan (15, 16, and 17 December)! 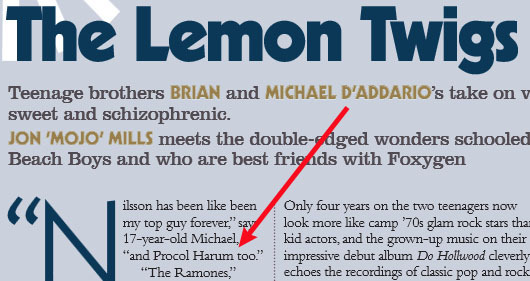 Why does BtP keep mentioning The Lemon Twigs? and they keep mentioning Procol Harum! Added a new page specifying the answer to this straightforward competition to win prime seats for the opening of the Brooker New York shows in December. It also shews the names of the three lucky winners and expresses thanks from 'Beyond the Pale' to the generous donors of the prizes. One more week for this straightforward competition: win prime seats for the opening of the Brooker New York shows in December (thanks, Paul, thanks Kay). Added this link to more excellent work from The Lemon Twigs ... this time using Steinway grand instead of the usual range of e-keys. 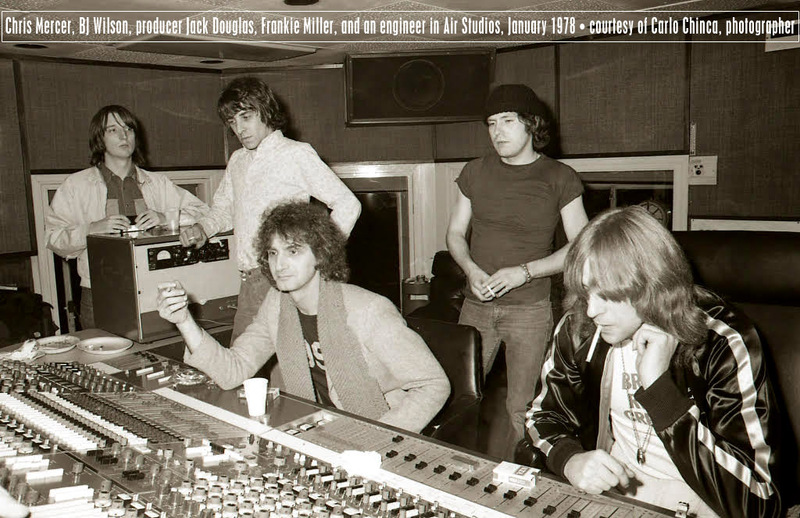 Listen to the 23-minute file ... three songs, and two interview segments ... Procol Harum name-checked aeound 15m 40s, incidentally, alongside Fab Paul. At the moment some people are disqualifying themselves by sending in responses that are not single words as requested (no need to repeat the question, nor to write a sentence or other screed from which we have to extract the winning info). And others are disqualifying themselves by not sending their street address. So we'd like to clarify! In your e-mail, write a one-word answer to the puzzle; additionally, write your name; also write your street address; but please don't write anything else. Added a straightforward competition: win prime seats for the opening of the Brooker New York shows in December (thanks, Paul, thanks Kay). Today is BtP's 19th birthday ... and it falls on a date on which we always remember the life and music of the great BJ Wilson.